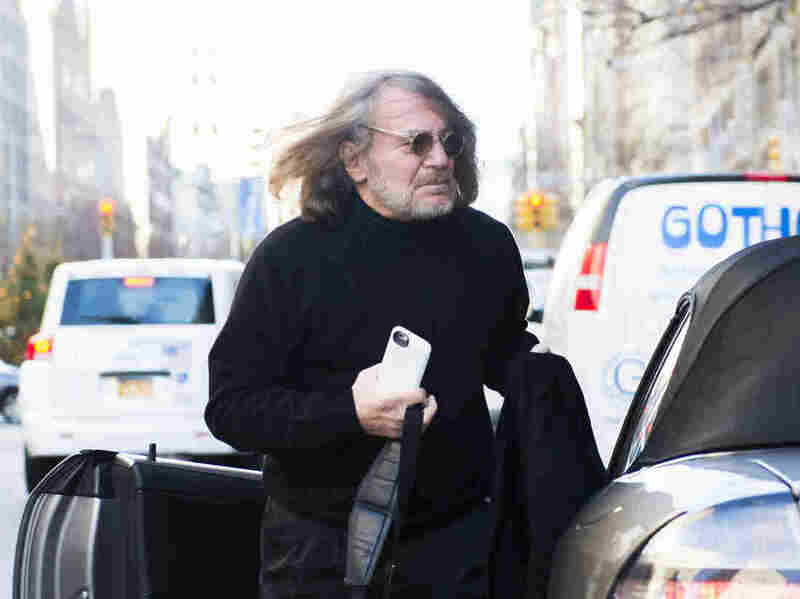 Doctor: Trump Dictated Letter Attesting To His 'Extraordinary' Health : The Two-Way Dr. Harold Bornstein, who released a letter in 2015 describing Donald Trump's health in glowing terms, now tells CNN that the then-candidate dictated the whole thing. Dr. Harold Bornstein arrives at his office in New York in December 2015. 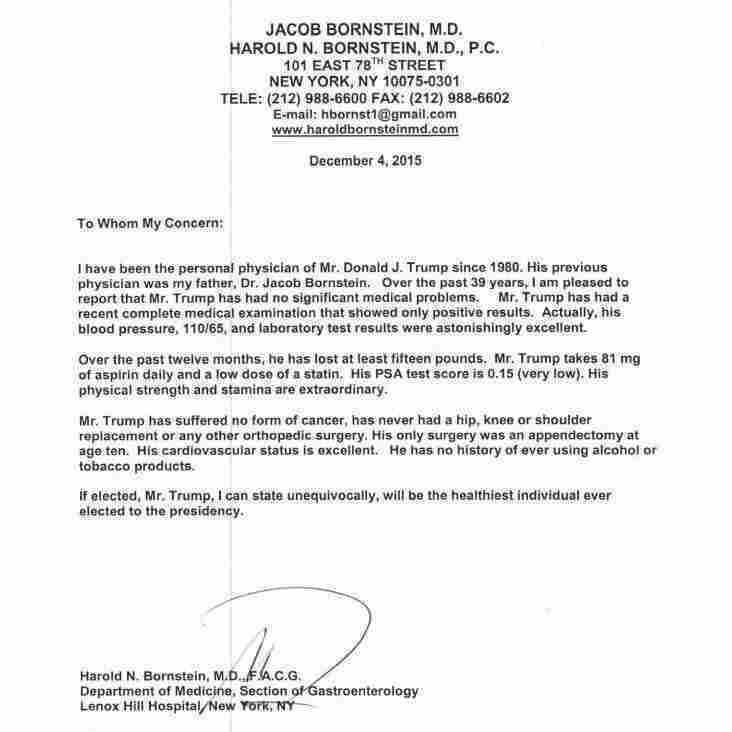 He released a letter in 2015 describing Donald Trump's health in glowing terms, but now tells CNN that the then-candidate dictated the whole thing. In December 2015, Donald Trump's personal physician released a letter describing his patient's health in language that sounded more like it was written by the patient himself than the doctor — and it turns out that might be exactly what happened. "If elected, Mr. Trump, I can state unequivocally, will be the healthiest individual ever elected to the presidency," Dr. Harold Bornstein, a gastroenterologist from Lenox Hospital in New York, wrote at the time. The letter said that a recent medical exam showed "only positive results" for the then-candidate and that "his physical strength and stamina are extraordinary." Trump's campaign released a summary of his medical history on Monday. As NPR's Jessica Taylor reported at the time: "The full letter is written in true Trumpian fashion, full of hyperbole and boasting of greatness. Bornstein calls Trump's blood pressure 'astonishingly excellent.' "
However, Bornstein now tells CNN that Trump was the one who wrote it after all. Trump, who was 70 when he assumed office, is the oldest person ever to be elected president. Bornstein's admission comes as he also tells NBC that a longtime personal bodyguard for Trump, along with a top lawyer at the Trump Organization and a third man, conducted a "raid" on his office on Feb. 3, 2017, in which they seized the president's medical records. Bornstein told the network: "They must have been here for 25 minutes or 30 minutes. It created a lot of chaos." He said he felt "raped, frightened and sad." That incident in 2017 occurred just days after The New York Times published a story based on interviews with Bornstein, who told the newspaper that the president takes a prostate-related drug to treat baldness, known as Propecia, as well as other "antibiotics to control rosacea, a common skin problem, and a statin for elevated blood cholesterol and lipids." The administration on Tuesday denied that the visit to Bornstein's office last year was anything out of the ordinary. Sarah Sanders, the White House press secretary, called it "standard operating procedure" to obtain a newly elected president's medical records. "That was what was taking place, is those records were being transferred over to the White House medical unit, as requested," she said.